To whom it may concern. I’ll be damned, it’s noon and already 10 texts deep. $1.50. I don’t like repeating myself. I really really don’t. I only do that when a first attempt at sending a message doesn’t go through…you know, like when you attempt to send a text message to somebody and it fails so you resend. While we’re on the subject…let’s stay there. Half of these texts are from people whose numbers aren’t saved in my phone, so I have to call them back to see who it is and cuss them out. 90% go to robot voicemail. 90% of these texts are during peak hours, so I get charged for approximately 18 one minute calls before 9PM trying to get reimbursed my 15 cents. I have 600 anytime and free nights and weekends on my plan. I usually use about 587 minutes in the winter months (I like to leave a lil room so I don’t get charged $1.25 per minute for going over 600). Therefore, I run a risk of going over my anytime minutes by about 5 minutes. – Get a shape-up (or a full haircut if I see my man Jay-Mee) and have $3 left over for a new toothbrush…the good kind with the bristles that reach deep in the gums and massage them. – Fill half my tank with Mobil 87 gas (since prices went back down). – Buy 2 bags of Asian Style Chicken Breasts at Trader Joes (with some money left over if I get lighter bags). – A 6 pack of Adidas Moisture Wicking Athletic Crew Socks at Marshalls. – A sealed copy of Pimps Up, Hoes Down on DVD via amazon.com including shipping. – 31 stamps and only having to come out of pocket $0.02. Hopefully sending this message out early in the holiday season thwarts some of this text message crap and I can save some money and save you the impending headache of me bossing up on you for my $0.15…because I swear on a stack of James Brown 45’s I’m not even kidding, I’m dead a$$ serious. If you strike on all 3 holidays, that’s $0.45. Learn to contact people directly when you think of them. Yeah it takes time, but it was never a problem before text messaging. E-mail me (it’s free!!!! ), get at me personally or remove me off your text list because your tab is running and ye$ I will be paid, I will be paid. Props to Strictly Beats for putting me up on game. Peep the site, and download some Ronald Jenkees originals. It is almost two years ago to the day that I conducted one of my favorite interviews, with one of my favorite producers (and I mean that in the truest musical sense) ever, Khayree. For a bunch of different reasons the piece has never been published, but I still haven’t given up hope. Over the years I’ve stayed in touch with Khayree though, and yesterday he hit me up letting me know about a series of podcast tributes to himself, Sam Bostic, Mike Mosley, and E-A-Ski & CMT. The show is hosted by Ya Boy Black Ice who is from Richmond and either lives or broadcasts out of a station, 187 Radio, in Paris, France. Each show runs about an hour, and chronologically plays through select joints from each respective artists discographies. Start with Khayree, and then peep the rundown of the other shows here. I picked up a side job writing bios for the Bay Area based label Ehustl (major propers to Michelle from Audible Treats for the hook!). At the moment, I’m piecing together a little something for a group consisting of Keak Da Sneak, Q-Z and Baby S (think Kurupts, “We Can Freak It”) and their album Word Pimpin 2. 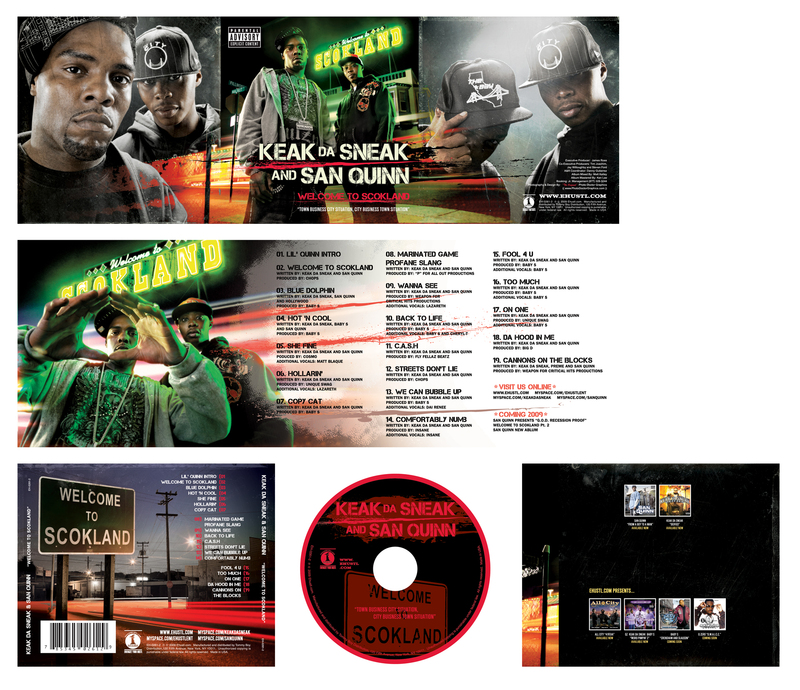 The album is cool, but I’m really looking forward to the next project with San Quinn and Keak for their collaborative project Welcome To Scokland. I’ve only heard one song, “Back To Life,” and if it is a sign of things to come the Bay has something to look forward too. You can peep the album art and tracklist below and “Back To Life” after the jump.